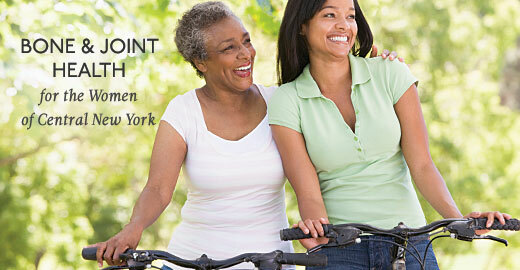 Upstate Women’s Health provides the complete range of services that women need to maintain their bone health. Upstate Orthopedics is dedicated to providing specialized, expert care for patients of all ages, and all levels of physical activity. Recognizing the uniqueness of the female musculoskeletal anatomy, they are committed to providing compassionate treatment based on a woman’s individual orthopedic care needs. The Surgical Specialties Clinic is staffed by the specialists from Upstate Orthopedics at 550 Harrison St. in Syracuse sees many patients who have been treated for trauma injuries at Upstate University Hospital and require follow up. The Upstate Bone and Joint Center on Fly Road in East Syracuse, provides an easy to navigate, one-stop shop for our patients’ orthopedic care needs, head to toe. Whether you are a female athlete looking to get back to your competitive edge, an on-the-go mom with an untimely injury or an active senior facing a hip replacement, Upstate Orthopedics is ready to get you back to the activities you love to do. Their goal is to give you the opportunity to enjoy the most out of life. Upstate Orthopedics offers consultation, evaluation, and treatment for the full spectrum of orthopedic conditions, and for all ages. Surgeries, x-rays, CT scans and MRIs, and rehabilitation therapy are available at Upstate University Hospital’s Downtown and Community Campuses, and at the Bone and Joint Center on Fly Road in East Syracuse. Additionally, the Bone and Joint Center has pain treatment, and after hours services to provide care when you need it. When those orthopedic emergencies occur outside regular business hours, or on a Saturday morning, you can utilize the very convenient services of OrthoNOW! and Sports Medicine Walk-In Clinic . Upstate Orthopedics knows that orthopedic injuries rarely happen when it is convenient, and their two after hours care programs make excellent care by Upstate Orthopedics available when you need it. Upstate’s expert physical and occupational therapists of the Physical Medicine and Rehabilitation Department know how to help you recover from your injury or how to strengthen your body to help prevent injuries. With five convenient locations, the specialized care and treatment that a woman needs is available when you need it. "We do it every day. We do the hardest. We do the simplest. We do everything orthopedic." Please contact the Upstate Orthopedic Surgery office at 315-464-8600 for questions, referrals or to schedule an appointment or Contact our Women’s Health Network Nurse Liaison. Last Modified: December 6, 2017. Contact LisaMarie Vigliotti-Bane with questions about the content of this page.